You don’t see a lot of recipes on this site for labor-intensive or instruction-heavy dishes like chocolates or sushi or cheese or fermented things. I know, people make that stuff. Good for them. I like to look at their food pictures. But these days complicated recipes aren’t for me. My schedule doesn’t allow it. And frankly, it’s not usually the way I want to eat. I can’t imagine you do, either. Plus, I often feel a bit let down when I dig into a labor-intensive meal I’ve prepared. (As in…”That’s it?”). I feel more energized from cooking a quick, tasty recipe than a time-consuming, overwrought one. Don’t get me wrong. There was a time when I loved big, elaborate recipes – mashing, basting, rolling, weighing, measuring, molding, sculpting, etc. Now I just leave those sorts of preparations to other qualified people. I can’t say I’ll never go back to all-day cooking sessions, but for the moment, I’m keeping things simple. (Not to mention a particularly unappealing phase of late winter has set in, and I’m fed up and scrappy). 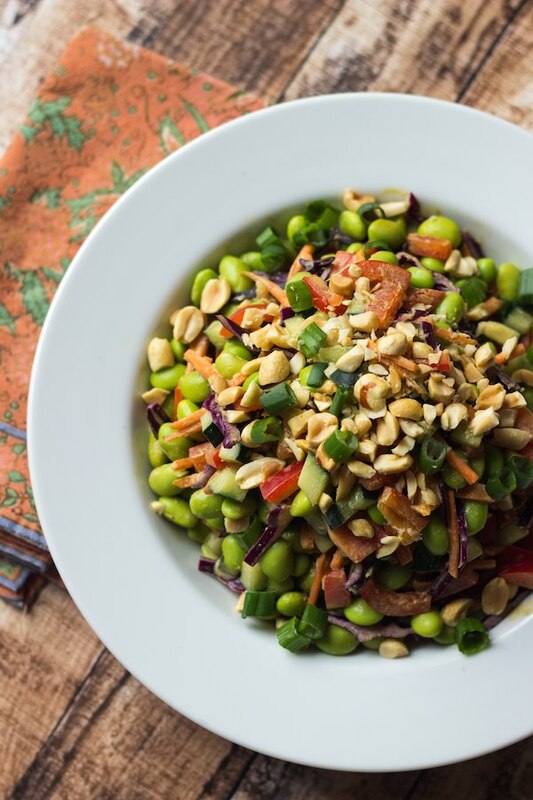 That’s where this Thai Edamame Salad recipe comes in. Frozen edamame is something I always keep in the freezer. It’s great for salads and stir fries and is packed with fiber, protein, vitamins and minerals. You can even blend the beans into a hummus. These little ‘immature’ soybeans (they’re picked young) are a perfect snack, either from the pod or shelled. You can find both versions in your frozen food section. I dress this salad with a Thai-inspired peanut dressing. Blend up some extra dressing, and these beans would be fabulous tossed with some rice noodles. Here’s to quick and easy! What’s your favorite way to eat edamame? Let me know in the comments below! In a blender, combine all dressing ingredients and blend until smooth. Toss about three-quarters of the dressing with the salad ingredients. Top with optional garnishes, if you like. I love snacking on edamame.. but never would have thought to use it in a salad before. I have to try this! YAY! Glad you are digging it, Janet! Sounds delicious! Is that 2 cups edamame after it’s been cooked & shelled? Also, how many servings is this recipe? Hi Lori! Yes, it’s 2 cups after the edamame is cooked and shelled. The recipe makes about 4 good-sized side servings. So good! I had this for dinner tonight. I had a bagged of chopped salad that had purple cabbage and carrots in it, so I tossed it with the cucumber, bell pepper, and edamame. I absolutely love the dressing. When making it, I didn’t have any sriracha on hand so I used sweet chili sauce instead. I will definitely be making this again! I’m so glad to hear, Elyshia! The sweet chili sauce sounds like a great option! Can’t wait to try it!!! Thanks for my weekly reminder that i really don’t need dairy and eggs. Always inspiring! Love the links and weekly quotes, too. Thank you! Made this for dinner last night and we are in love!! Substituted a tsp of coriander as we were out of fresh cilantro, turned out great. Suggestion? Double the dressing so you have plenty left over, it is addicting….